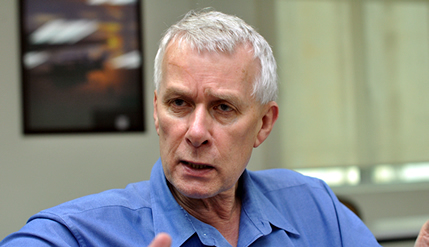 LANGKAWI, KEDAH, 1 Oct 2013 – The National University of Malaysia’s (UKM) new Nobel Laureate-in-Residence Dr Richard Roberts says he was motivated to find a cure for cancer and actually did not set out to win the much-coveted prize. Speaking to Malaysian scientists here, Dr Roberts said the thought of winning the Nobel prize did not occur to him, but he was much concerned about supporting his growing family. The British-born winner of the 1993 Nobel Prize in Medicine or Physiology told the Malaysian researchers at a UKM-organised Nobelist Mindset Workshop dialogue session here today that he enjoys making discoveries that would make a difference to society. The programme which brought together some of Malaysia’s brightest scientists with the molecular biologist started on Sept 30 and concluded on October 4th. It was aimed at instilling a mentality of innovation and excellence in scientific research. He advised the twenty-five young Malaysian scientists from local research universities that they should only do experimentation if they like it and not necessarily for fame and fortune. “You cannot set your mind to win a Nobel prize. Some of these discoveries are serendipitous. If you’re lucky, it might happen,” he stressed. Dr Roberts said personally he had been fortunate to come across the opportunities which he seized upon. “I happen to be in the right place with the right mind at the right time, and you have to ask the right questions,” he explained. Unlike many other scientists, he also considered himself lucky that he did not have to teach to make a living. “I didn’t like to be taught and I know many brilliant young people today who don’t either,” he said. The reason was that as a young schoolboy and student in college, he did not like classes and the rote method of learning in England of the 1950s and 1960s. “I was a rebel who played truant and preferred to play snooker at the local pub in town. I did not like to follow lessons,” he said. Nevertheless , he perservered and eventually toed the line because he did not have other choices at the time. When asked for the qualities to be a succesful researcher and scientist, he paused and then gave a rather philosopical reply. “Charisma is the biggest thing. It’s nice to have good ideas but you also need to have charisma and force of character. Charisma is very important,” he added. To a question over what governments should do to foster an environment conducive to budding scientists, he was quite blunt. “If I were the Minister of Science, I would seek enthusiastic people with interesting projects, just give them money so they wouldn’t need to do anything else than investigate and let them work ten years to surprise us,” he quipped. On his work that led to winning the Nobel prize, he said it started in the early 1970s when he went to America to try his luck after failing to secure a resarch job in Britain. He said in 1971 the Nixon administration poured money into cancer research while other fields got less attention. So he tried researching DNA to detect cancer genes. Instead the work led him to developing the mechanism of gene-splicing in procaryotic, or primitive single-cell organisms such as bacteria. He discovered introns, or sequences of nucleotides that were removed by gene-splicing. He submitted his work to the scientific journals in 1973, but recognition only came in 1993. Born in Derby, England in 1943, his family moved south to Bath when he was four where he went to school and university. As a child he at first wanted to be a detective and then, when given a chemistry set, a chemist. He failed his Physics A-level exam on his first attempt. He graduated from the University of Sheffield in 1965 with a Bachelor of Science degree in Chemistry and a PhD in 1969. Dr Roberts have four children and two grandchildren. None of his children have followed him into scientific research. UKM is the only university in Malaysia to have Nobel laureates-in-residence. The first was 2006 Nobel Peace Prize winner Prof Dr Muhammad Yunus of Bangladesh.